I think I need to be more attentive to this blog. Obviously I’ve been sleeping better because I haven’t been writing. Ha! Thank you Unisom! We went on our Maui Babymoon a couple weeks ago and it was fabulous! We did lots of snorkeling, relaxing, and sightseeing. 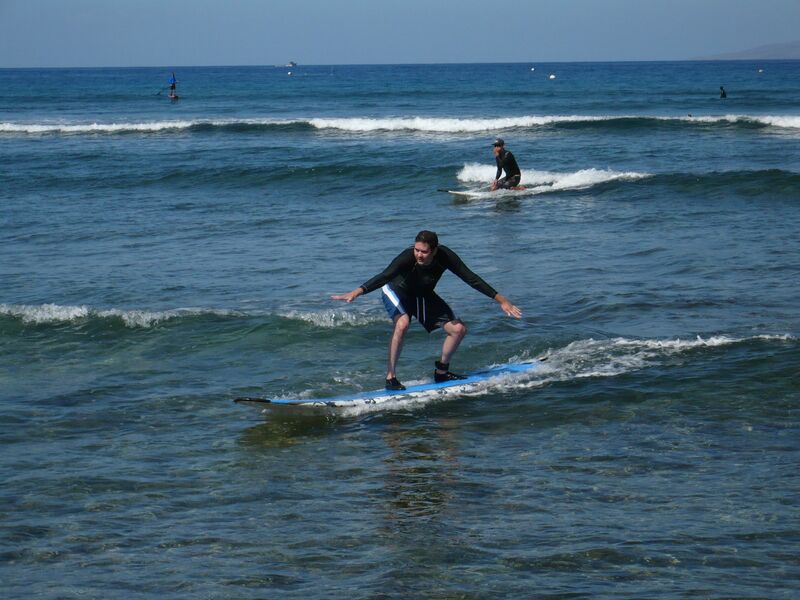 And the husband got to take a surf lesson. I was so proud of him! He stood up on every wave he caught! He went to Maui Waveriders in Lahaina for his surf lesson. Of course, we ate lots of shave ice. My favorite! Napili Bay is awesome for snorkeling! We went there the day after going on a boat to Molokini and I think I liked snorkeling in Napili Bay better. The beach is beautiful and we saw lots of fish and coral and some sea turtles and the husband saw squid. Best of all, it was free! The Gazebo Restaurant. Wowza! If you go to Maui, you’ve gotta get breakfast at this place. It’s my new favorite breakfast place. It’s located at the Napili Shores condos. There’s a long line to get a table, which I usually don’t mind because that always means the food will rock your world! I got the Macadamia Nut Pancakes and some fried potatoes. Both were so delicious! 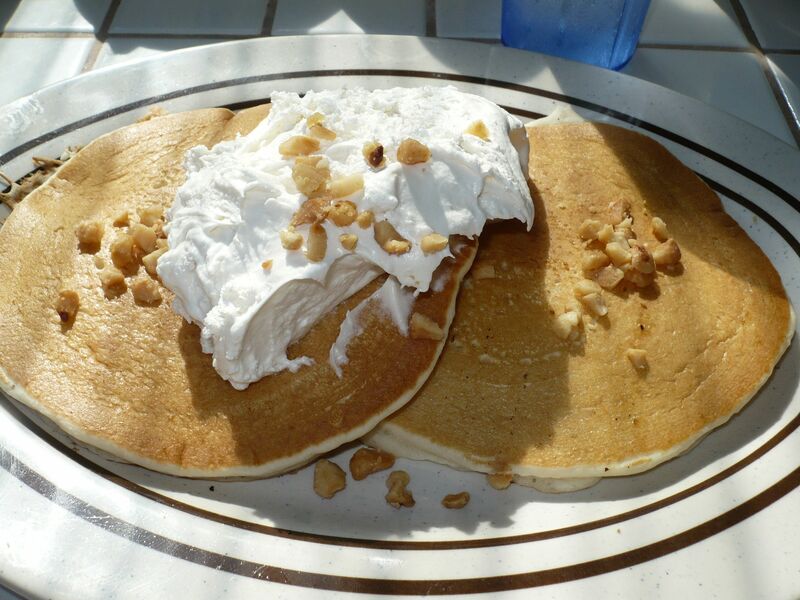 They even had coconut syrup on the table, which I smothered my pancakes with. Mmmm! I can’t wait to go back! The Flatbread Company in Pa’ia makes some good good good pizza! Pa’ia is a little hippy town a few minutes east of the airport. Actually we discovered this place on our last trip to Maui 1.5 years ago. They’ve got yummy root beer made from sugar cane, salads that they claim are very good, but I’ve never had one, and some pizza that will create magic in your mouth! So make sure you visit Flatbread when you go to Maui. It was our first meal of our vacation, and our last meal. Pa’ia Bay Ohana pizza at Flatbread. 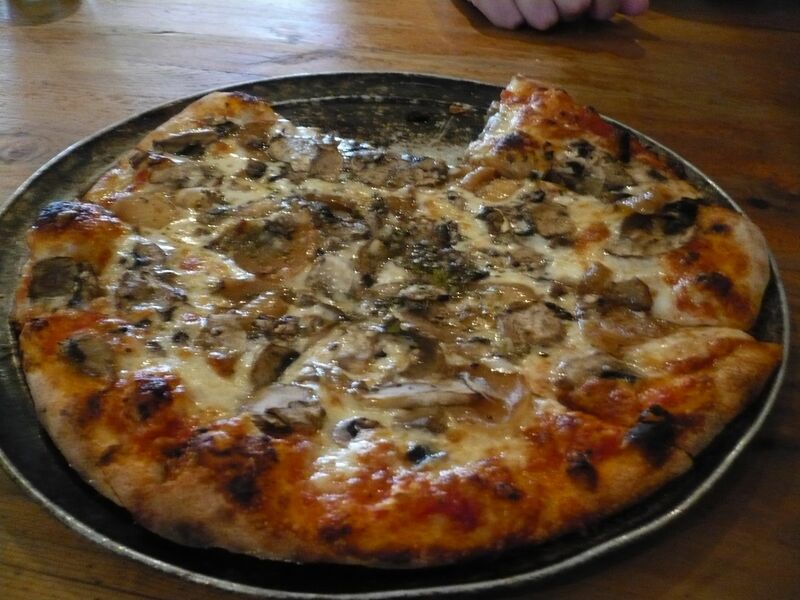 Topped with their in-house made pizza sauce, mushrooms and sweet Maui onions. Ululani’s Shave Ice in Lahaina. I saw a location near the airport too, and I think they may have a few other Maui locations. The Shave Ice here was deeeeelicous! The guy who works there (owner maybe, I don’t know) is a Shave Ice master and was constantly feeling the ice and adjusting the machine to make the perfect shave. They let you get 3 syrups on your Shave Ice and they make almost all of their syrups. This Shave Ice place is awesome! 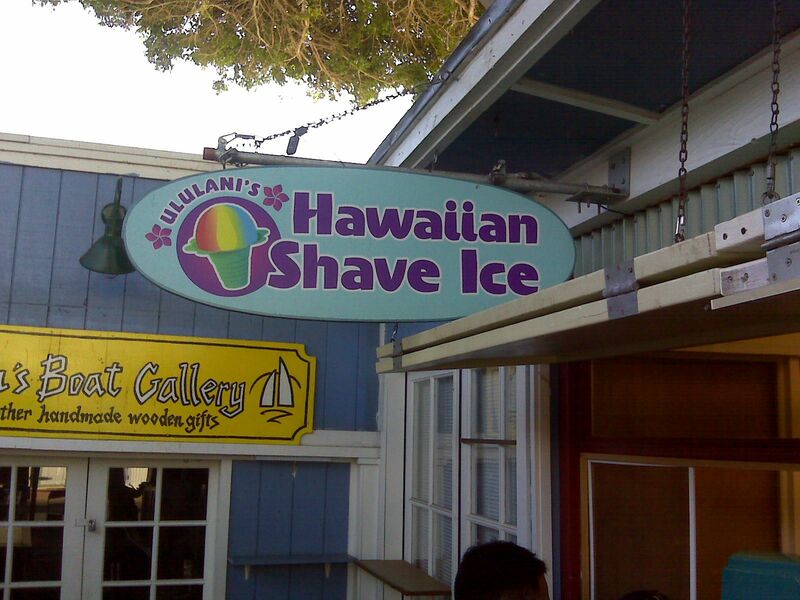 If you to go Lahaina, you’ve got to get Shave Ice here. To save money on the snorkel trip we took to Molokini, we agreed to do one of those timeshare presentations. Ugh. Big mistake. We were told that it would take 1.5 hours, and that there would be food. So we scheduled it for 11:30 and arrived ready to munch on some yummy Hawaiian fruit. Sadly, all they had for us was coffee and water. Not cool! I didn’t bring any snacks with me and the presentation took 2.5 hours but felt like 8. I told the presentation lady right off the bat that the only reason we were there was for the discounts. We did not have plans to buy anything. Apparently that didn’t matter because she did everything she could to take our money and be our best friend. “I’m so excited about your baby!” “Oh, you’ll have to email me a picture of her when she’s born!” Eww. No way, crazy! Anyway, for attending this session of torture, we got $80 off our snorkel trip and $100 cash, which we blew on a fancy dinner that turned out to be a bit of a disappointment on our last night on Maui. Oh well. Lesson: unless you want to waste a lot of your vacation time being pressured into buying an overpriced timeshare that you probably won’t even use, and you don’t mind being looked at and talked to like you’re a moron for not wanting to take advantage of this “unbelievable” deal and saving a few bucks on a snorkel trip or something is really important to you, just say NO to the timeshare presentation. It’s not worth it. No, we didn’t buy one. For what we would have been investing into the timeshare to take one yearly vacation for a week, I could take 3 or 4 vacations a year. I’m a bargain shopper. It was a rip off. So, besides the torturous time share session, the trip was great! Perfect weather, yummy food, and lots of fun. I love vacation!